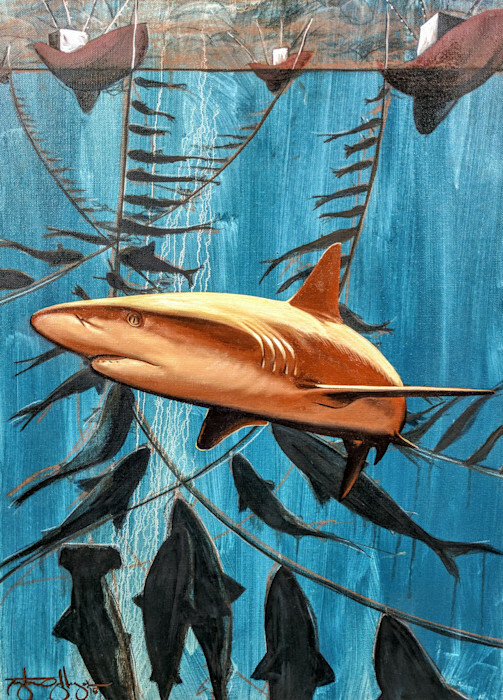 "Shark," oil on canvas, 24 x 18, 2018. Sharks are some of the oldest animals on the planet and haven't changed a bit in eons. They are the perfect predator. They keep the balance. Nature needs them. Humans are so afraid of them though, that we have killed them off as well as we can. Now they are being killed for their fins to make Shark Soup, which is an Asian delicacy. The sharks are caught, finned and then tossed back in the water to die as they sink to the bottom. Sharks are frightening, but they still deserve to have a place on this planet. The Life series inspired by life on this planet and my increased awareness of it in recent years. The series began with an almost daily (at times) pilgrimage to the sea by way of surfing I began to really connect deeply with the ocean and her living inhabitants. I began thinking in terms of the natural world with swells, tides and winds and had close encounters with dolphins and all kinds of sea birds. I was thinking, dreaming and reading about the ocean. That how I became aware of the state of the ocean, its life, and the affect that humanity is having upon it. I learned that our oceans, and their flora and fauna are facing hard times. Sea life cannot defend itself against commercial fishing, increases in global ocean temperatures, multitudes of plastics and rising toxicity levels. From there it has expanded to include all life on this planet. We're all connected. We will all share the same fate in terms of how our mother earth fares. These paintings are a statement of awareness, respect, love, sadness and hope.